IT IS the largest coral reef system on the planet. It is the world's largest single structure of living organisms and can be seen from space. 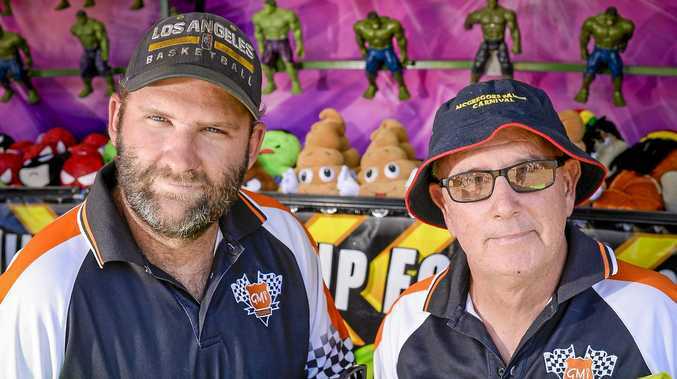 It supports thousands of Queensland jobs, provides millions in tourism dollars every year and is one of just seven World Heritage Sites in the Sunshine State. And it is under threat. In the past 27 years, the combination of natural storms and cyclones, the crown of thorns starfish and coral bleaching have led to the loss of half of the reef's coral cover. 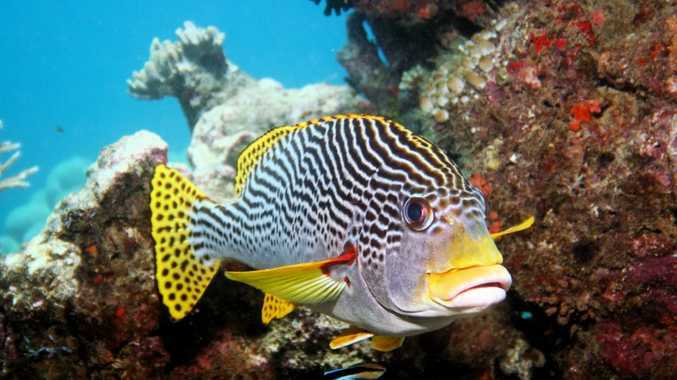 A 2009 report on the outlook for the reef also cited climate change, declining water quality from catchment run-off, loss of coastal habitats from coastal development and the impacts of shipping, fishing and illegal fishing as other threats. In its sobering report in October, the Australian Institute of Marine Science also predicted that if current trends continued, the remaining half of the reef's coral would be gone within 10 years. 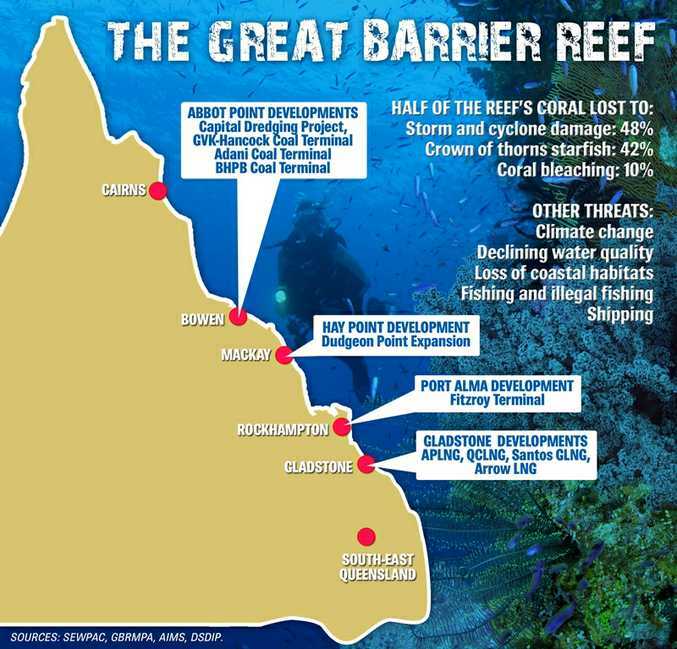 On top of the coral loss, numerous new port developments along the Queensland coast have compounded public concern for the reef's future. The United Nations World Heritage Committee has long known of many of the threats, expressing its "extreme concern" last year after the Federal Government approved three LNG projects on Curtis Island, Gladstone, in the World Heritage Area. Construction of the three LNG plants on Curtis Island is under way, while a fourth proposed development on the island has stalled, but it may still go ahead. As part of the expansion, the Gladstone Ports Corporation is dredging 46 million cubic metres of sediment from the seabed to create access for gas tankers. 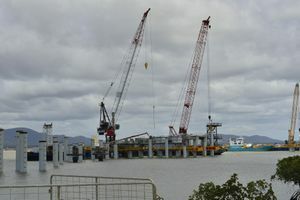 The dredging played a role in a national controversy, with renewed questions in recent weeks over a possible link between fish health problems in Gladstone Harbour and the project. Further north, a three million cubic metre dredging project is proposed at Abbot Point near Bowen to allow for new expansion at the port. The expansion was also on a list of projects which could impact the reef which the Federal Government provided to the committee last year. Since that list was handed over, the Queensland Government has abandoned an additional expansion at Abbot Point, recently asking for expressions of interest for a much smaller expansion in the area. The Federal Environment Department was also waiting on environmental impact statements for the Dudgeon Point coal port expansion at Hay Point near Mackay and the Fitzroy Terminal at Port Alma near Rockhampton. 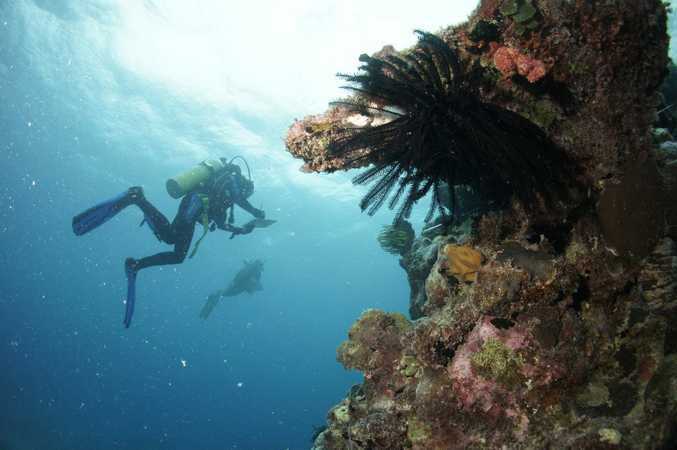 AFTER a monitoring mission to the reef last year, the WHC recommended no new developments be approved outside of existing port areas, and that a huge strategic assessment of the reef be completed. The strategic assessment is under way, with the Queensland Government and Great Barrier Reef Marine Park Authority working together on the report, with the first draft expected in early March. GBRMPA chairman Russel Reichelt said he saw the strategic assessment as an opportunity to set out a new, more rigorous path for the next 25 years. The WHC also asked the Australian Government to ensure "development is not permitted if it would impact individually or cumulatively on the outstanding universal value of the property". Mr Reichelt agreed, saying the cumulative impacts of all the threats to the reef, including climate change and port developments, should be the target of future efforts. "It's a general principle of mine that any environmental assessment should look at the context of the approvals," he said. Mr Reichelt said for too long assessments had focused on the short term effects of a single project, rather than looking at the environmental limits of an area to ensure future developments did not cross the threshold. Russell Reichelt, CEO of the Great Barrier Reef Marine Park Authority. Contributed. He said the long-term view was an essential part of the strategic assessment, but could not go into detail about what it would recommend. Mr Reichelt and AIMS chief executive John Gunn had concerns about the cumulative impacts of dredging, floods and sediment run-off. All of the new ports would require dredging, and Mr Gunn said those combined effects had the potential for wider impacts on the reef. He said there were areas of the reef with high levels of suspended solids, and when water was disturbed by floods or dredging, the sediment could flow as far as 150km from the original site. While Mr Reichelt said he had not read the science, dredging and other human disturbances were an added risk to the reef, especially due to the wide flows of fine sediments in the region. Mr Gunn said the institute was planning to unveil a new tropical sea simulator later this year, which would simulate dredging, floods and other marine phenomenon to help improve knowledge of the reef. Above all, he was concerned that with half of the coral already gone, climate change presented the biggest challenge to ensure the decline of the reef was reversed. Mr Gunn said while he was confident the marine park was one of the best managed reefs in the world, there were still a lot of gaps in research that needed to be completed before all the threats could be known. Mr Reichelt, Mr Gunn and Acting Premier Jeff Seeney all said one particular approach to cumulative impacts, an assessment of all the proposals at Abbot Point, was an admirable effort to address the effects. Mr Seeney said the study had shown the impacts of the proposals were manageable, and that it was a great initiative of the proponents to ensure the proposals would not permanently affect the reef. While he supported the approach, he thought any expansion of such assessments at ports should remain an industry-led initiative, rather than be controlled by the government. 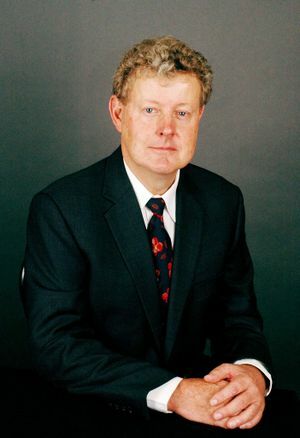 He said while Queensland needed the growth of the ports and industry to support the economy, doomsday predictions of the reef's demise were not helping. "We in Queensland live with the reef - no-one wants to see it destroyed, and because of that, we took the Labor Government massive multi-cargo facility at Abbot Point off the agenda. "We've called for interest for a new, much smaller development because we believe it will have a smaller impact, but still allows for that development to go ahead." What is the rush with pushing through all the new coal and LNG ports now, when we could wait a few years and make sure the reef is protected? The coal will still be there. Under the State Government's recently-released ports strategy, any further developments outside of existing port areas were taken off the table for the next 10 years. But Mr Seeney said the government would be approaching any new developments in increments, and he wanted to ensure any potential environmental impacts were limited. He said any further development of ports in or near the World Heritage Area would be something for the government of the day to decide in 10 years. Mr Seeney also said all the scientific data on recent fish health problems in Gladstone Harbour pointed towards the floods of a year ago as the main cause. He said reports that dredging was associated with fish deaths in Gladstone were a classic example of someone making a claim that was not based on all the scientific evidence. But the Australian Marine Conservation Society's Felicity Wishart was not convinced. She said while dredging may not have been attributed to the problems at Gladstone, dredging anywhere did cause direct impacts to the habitat being dredged and the area where spoil was dumped. Ms Wishart said instead of going ahead with the ports already in the pipeline, both state and federal governments should be waiting until the committee had reported its findings. "With all the risks already there, why don't we just hang on a second, and let's absolutely ensure these new ports don't pose a significant risk to the reef?" she said. "What is the rush with pushing through all the new coal and LNG ports now, when we could wait a few years and make sure the reef is protected? The coal will still be there." The Australian Government will report back to the committee on its progress on February 1, with more details of the strategic assessment to be released in coming months. It is clear balancing the environmental protection of the reef with the economic benefits of the coal and LNG industry will remain a lingering question for years to come. And by all reports, every agency involved is doing all it can to find the right balance. In June the public will find out what the World Heritage Committee thinks about the current status of the Great Barrier Reef and the plans for its future protection. They will spend months poring over the details, with one particular question in mind: will the words "In Danger" lead the report?